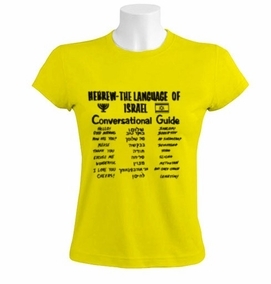 The language of Israel (Hebrew), is not easy to learn. This shirt contains some basic sayings, such as "I Love You" and "How Are You Doing", printed on the front of a high-quality T-Shirt. Our t-shirts are made of 100% cotton and are long lasting with bright colors. Our products are all designed and printed in Israel.